Save files in this format - Sets the default file format that is used when you save workbooks. If your workbooks are used in different versions of Microsoft Office Excel, as Web pages, or in other programs, you can select the file format that you most frequently use. In this list box, click the file format that you want to use. Save AutoRecover information every - Automatically creates a workbook recovery file at the interval that you enter in the minutes box. The interval must be a positive number from 1 to 120. If your computer stops responding, or if you lose power unexpectedly, the AutoRecover file opens the next time that you start Excel. The AutoRecover file may contain unsaved information that would otherwise be lost from your original workbook. If your original workbook was damaged, you may be able to recover information from the AutoRecover file. AutoRecover file location - Displays the default AutoRecover file location. In the text box, type the path that you want to use as the AutoRecover file location. Unfortunately there is no folder browse button so you have to copy and paste the folder path. Don't show the Backstage when opening or saving files - (Added in 2013). By default when you press (Ctrl + O) or (Ctrl + S) the backstage view is displayed. This lets you go straight to the Open or Save dialog boxes instead. Show additional places for saving, even if sign-in may be required - (Added in 2013). By default when you select Save As you are shown additional options for Office 365 and OneDrive. If you do not use online services this lets you remove these options. If you are on a corporate network this will probably be the default although the checkbox will not be ticked. Save to computer by default - (Added in 2013). By default when you select Save the backstage view will default to Computer. If you always want to save files locally or on a network drive then you should have this ticked. If you are on a corporate network this will probablu be the default although this checkbox will not be ticked. Default personal templates location - (Added in 2013). In the text box, type the path that you want to use as the default template file location. Unfortunately there is no folder browse button so you have to copy and paste the folder path. Show data loss warning when editing comma delimited files (*.csv) - (Added in 2016). AutoRecover exceptions for - Lets you specify the workbook for which you want to disable or enable AutoRecover. In the this list box, select the workbook that you want. Disable AutoRecover for this workbook only - Disables the AutoRecover feature for the workbook that you select in the AutoRecover exceptions for list box. 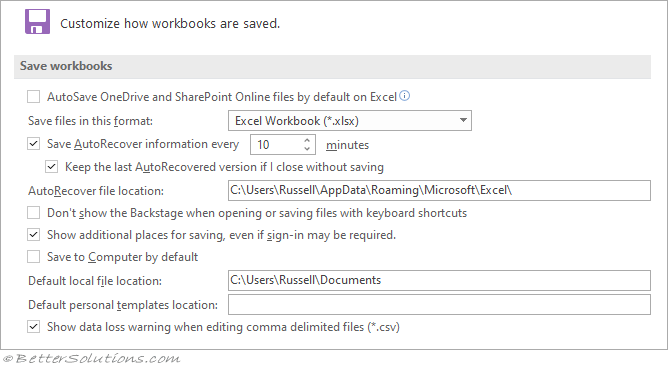 Save checked-out files to - Specifies the location where you want to save checked-out workbooks. The server drafts location on this computer - Uses the server drafts location on this computer to save checked-out files. The Office Document Cache - In Excel 2007 this used to be the "The web server". Uses the Web server to save checked-out files. Server drafts location - Displays the default server drafts location. In the text box, type the path that you want to use as the server drafts location, or click Browse to locate the server drafts location. Browse - Lets you browse to the server drafts location. Choose what colors will be seen in previous versions of Excel - Lets you edit the color palette that is used when the active workbook is opened in an earlier version of Excel. Click Colors to change colors on the Color tab of the Color dialog box.